The New York Marathon in itself was an incredible experience to be had. However, equally, if not more impactful for me, was the entire trip itself. I grew as an individual tremendously (not like that, I am still 5’2″) and discovered and re-discovered passions and things that I enjoy through the trip. This trip was different to me, because I was travelling solo. The cool thing about travelling solo, (or just being open and aware to your surroundings) is that it forces you to be more aware of your surroundings and those around you, and if you are anything like me, you will make gobs of conversations and friends. How cool would life be if we weren’t all just focusing on living in our own little bubbles, distanced from one another so not to burst them and let them in? How cool would it be if we were always connecting with new people that have new ways of looking at things and new thought processes and different experiences to discuss? How big would our own world get? The ability to connect with others wherever we go is vital to life (and happiness, in my opinion) and thus I do not understand when, as a cultural norm, we do not connect with one another. No eye contact, no conversation. Like we are afraid to interrupt one anothers’ lives? I understand when an individual does not want to connect for a season of time. I have been there myself. But to be in a culture that accepts as non-connection as the norm is befuddling. And, a bit scary. Maybe I am naive. Or maybe everyone is feeling the same way as I am?? There’s Ava from Germany, who just moved to NY as a lawyer and has been there for 3 months now .. I met her as she was attempting to take a selfie of her and a building she came across. I offered to take the picture for her. It didn’t come out as I had hoped, with all the people walking around and by and in the picture. (So many people, everywhere!) It was very cool to talk with her some about how she wants to improve her English to help her in her profession. Here is Amett, from Sweden. We shared stories at the pasta dinner the night before the marathon. She wants to do the “Big 6” marathons – Chicago, Boston, NYC, London, Berlin, and Tokyo. This was #4 for her, she has already done Chicago, Boston, and Berlin, I believe. (Side note, how cool that 3 of 6 of the “Big 6” are in the US?!) She was fantastic to talk with. I really enjoyed meeting her. Pasta dinner – people everywhere! Here’s another first-time thing for me, this girl from nowhere Western Pennsylvania – I hailed my first cab. I decided at the Expo that while in NYC I needed to do this, as I had never done it before. Thus, I Googled, “How to Hail a Cab” while at the Expo picking up my race supplies. Yes, I know, it is very simple, and anyone that has seen a bunch of movies knows how to do it even if they haven’t, but I have not seen that many movies and there are also tidbits of info to know about how the TAXI light is lit up atop the cab as to whether it will stop for you or not. It was a cool experience. I decided to go ahead and do it when I was getting turned around on the Subway going the wrong way, etc. As I think back on it, I should have Googled how much to tip the driver. He seemed aggravated at what I left him. I don’t think it was enough for him, in his eyes. This is Pedro. I think that is his name. I say I think, only because he is from Belgium. ‘Pedro’ does not sound very Belgian to me, but then again, I have not yet been to Europe, so I could be entirely wrong. 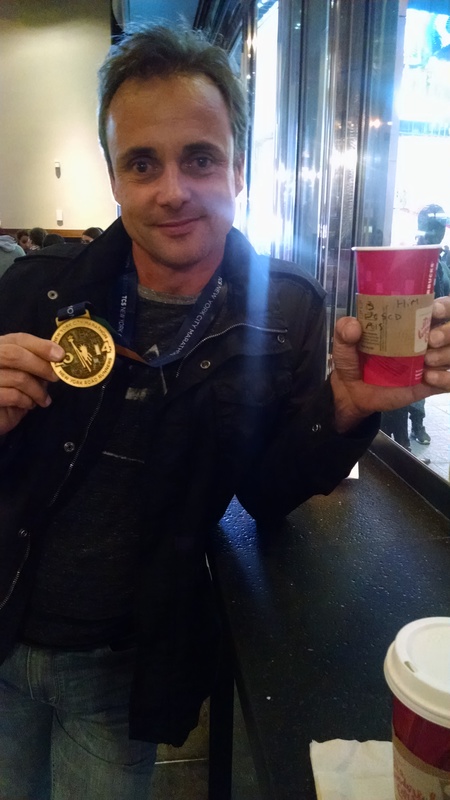 The NYC Marathon was his 45th. As I fixed my oats and banana at 4:30 in the morning before the race, he was eating a large (large!) plate of pasta and drinking a diet coke. The people I met were equally open and curious about me as I was about them. Maybe it was the marathon. Maybe it is the signal we put out to people that we are open to communication and connection. Maybe it was a combination of the two. After the race, as I was riding the subway back to where I was staying, I met Sebastian. A German man now living and working in Africa, we connected on the subway and chatted a little. Standing room only as the subway was packed with runners making their journeys back to warmth and showers and regular living, like walking, and eating, and stuff. This was marathon #5 for him. We decided that the other seemed ‘normal’ enough to meet back up and explore the city together. This was only my 2nd time setting foot in NYC, and the first time for me, I only was there maybe a total of 12 hours. I now had 16 hours before my train would leave Penn Station at 3 am, Monday morning. From there, we grabbed coffee (yay, caffeine! AND I had been planning for at least a week to have a tasty piece of biscotti with my lovely hot coffee) and made plans to go and search out a (hopefully delicious) local food spot. He wanted a beer (Germans) and I wanted a burger (undercalorified marathoner) and so we set out. The pub we wound up at closed the kitchen already (although it was only 7 on a Sunday night? I do not understand this). So, we hung out there and then sought out food. Dinner was great! It was not a burger, but it was red meat – steak and french fries. Also, however, not very big. We talked the entire time; I was fascinated by how different his life was from mine, and likewise he with mine. Sebastian and his medal! The coffee, if you can read, was made for “him” .. I told the barista that it was for “him” when they asked for a name, and they went with it. Ha! Times Square was next. Soft pretzel in the cold street, heated on a griddle with a man whom I did take a GREAT picture of, but for some sad reason it did NOT save. He lives in Brooklyn. It was a pleasure to support his business. Coffee again, and then an expedition to find some authentically tasty NY pizza. It was now 11:30 pm on Sunday night, but Times Square didn’t care. We trekked through the cold and stumbled upon a restaurant/pub that was .. awesomely enough .. offering karaoke that very moment! This made the night, and the trip. I loved the opportunity to sing in Times Square. We had a terrific time! And shared a delicious pizza (which we could not finish). Sebastian and I, and our medals, at 2:45 am Monday morning. He made sure I got on the train safe! My lesson, and I say this to you, ladies: this wonderful man was a gentleman. He did not ever make me feel uncomfortable, or try to make a move on me; he was respectful. He was kind. He treated a woman that he just met like a man should. I can’t say that about every man I have met. And I can even relate to the thought that they “don’t exist” .. but now I do once again believe it, that not everyone is just out to “get them some” and that there is still hope for a true connection out there for each of us, God’s plan to bring two people together in the world. His plans transcend all human understanding and we could never so perfectly manage each intricate detail to make them line up and come together as He does. Don’t be bitter. Be believing. Don’t ever lose hope. There are gentlemen out there and we should not close our minds to the idea of them. And THAT is how a former second wheel with a passion and excitement for adventure explores a city 8 million times the size of her. What freedom to know, we as people can go anywhere, anytime, and connect with anyone. And it should be that way! I thank God for this experience!! It reignited that independence, passion and excitement for life within me. In the future, whether travelling solo or with friends, I hope to remember and want to choose to connect with those around me, versus not.